There are MORE links below in Para 5 “More Related Links”. 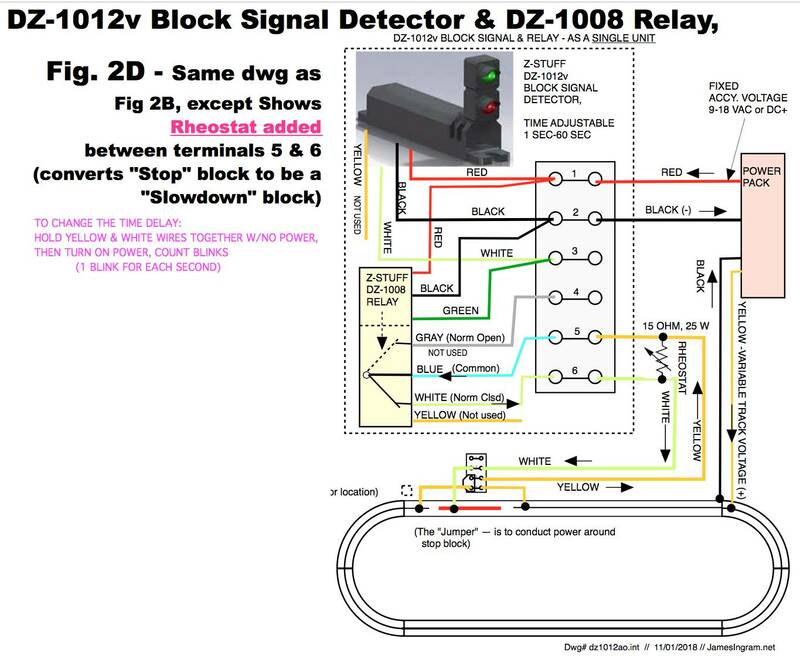 This video #668 shows a Z-Stuff DZ-1012v Block Signal Detector and DZ-1008 Relay automatically controlling 2 O-Gauge trains on the same track (see below photo). Part 1 of the Video demonstrates the “Delay From the Front” method — which we think is the most versatile. 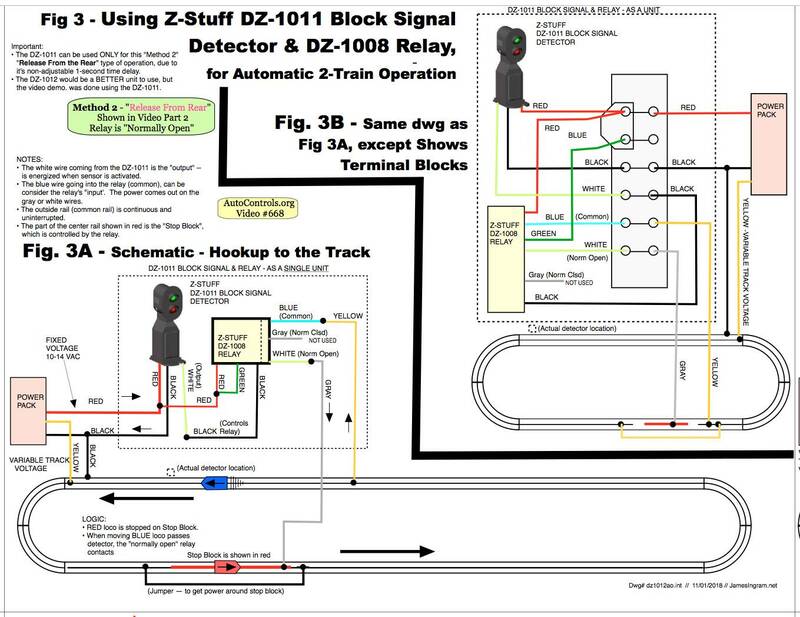 The train in front uses the “stop block” to delay a train following too closely. Part 2 of the video demonstrates the “Release From the Rear” method — which has a similar logic to the “Insulated Rail” method. 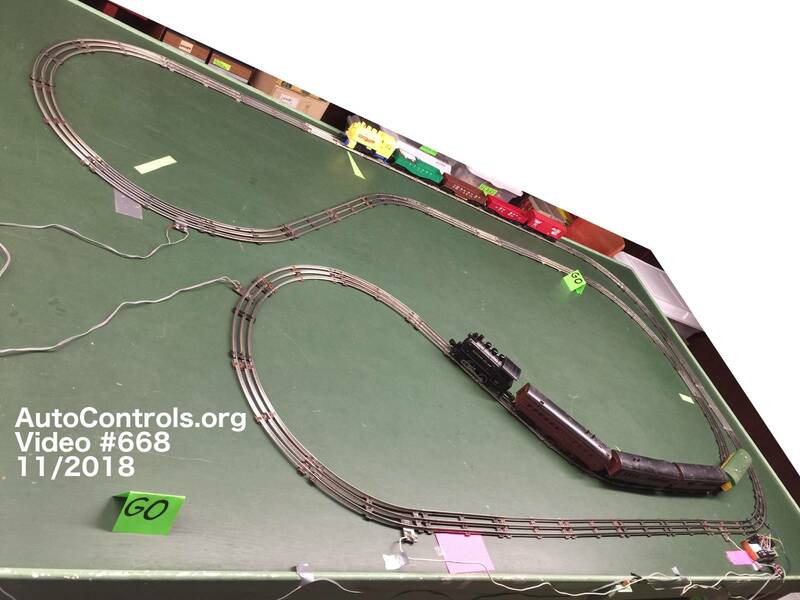 The front train is “trapped” by the stop block, and depends on the train approaching from the rear to “release” it. Note: CLICKING ON any of the below images, should open them LARGER. 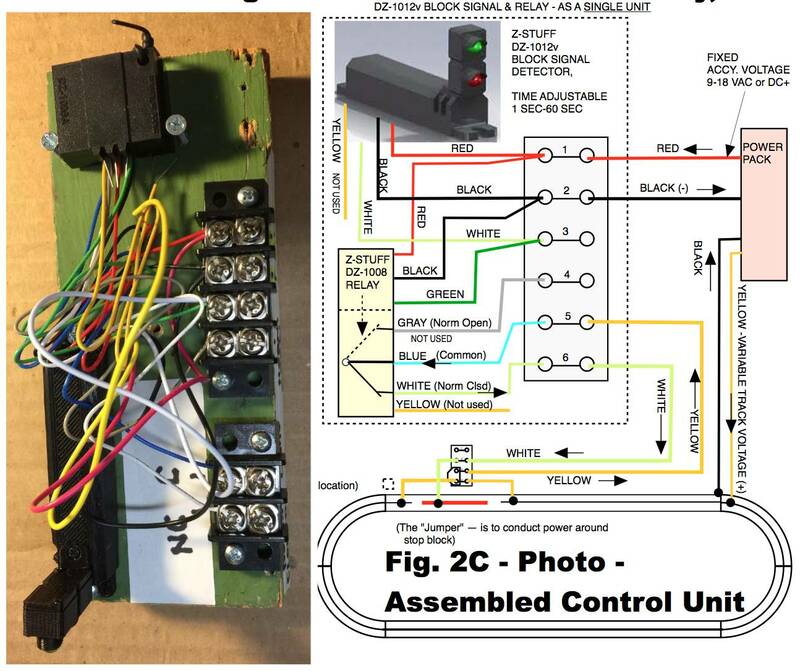 The next 3 images are from Part 1 of the Video — which demonstrates the “Delay From the Front” method. The last image Figure 3 is from Part 2 of the video — which demonstrates the “Release From the Rear” method. The “Delay From the Front” method is probably the most versatile method. If you make a small test layout, you can easily experiment with both methods. 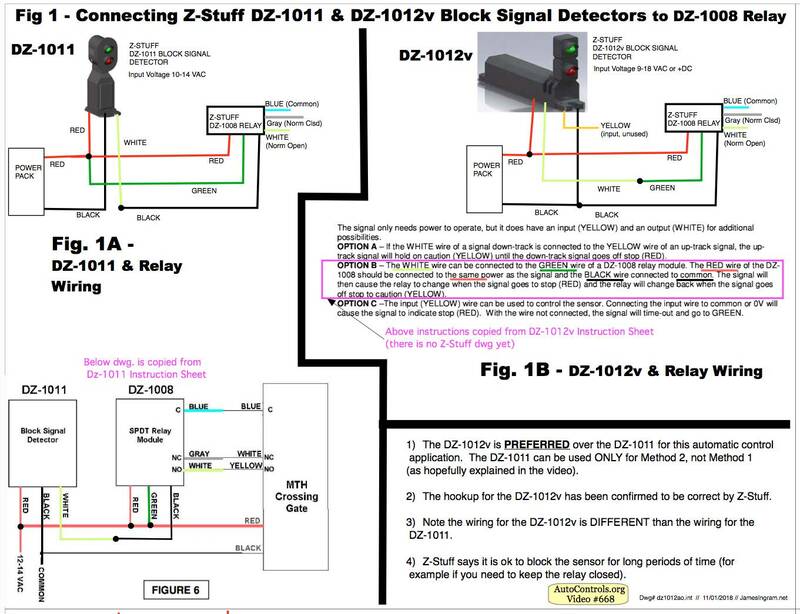 Note you need the DZ-1012v Detector to do the “Delay From the Front” method. The DZ-1011 Detector can be used ONLY for the “Release From the Rear” method. The below Figure 3 is from Part 2 of the video, which shows the 2nd logic method, “Release From the Rear“. 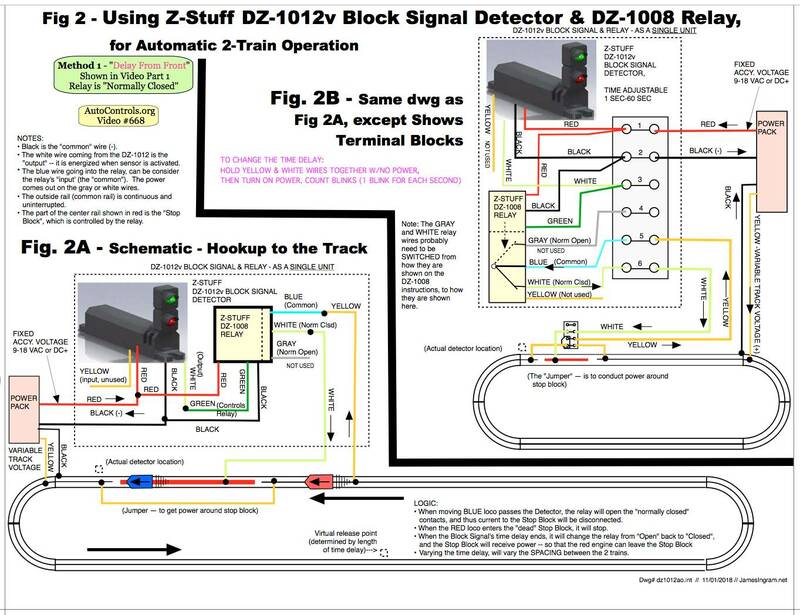 Note Bob Walker’s post of 11/13/18 contains a copy of his Oct. 2007 article from Classic Toy Trains on hooking up a block system, using Z-Stuff DZ-1011s.